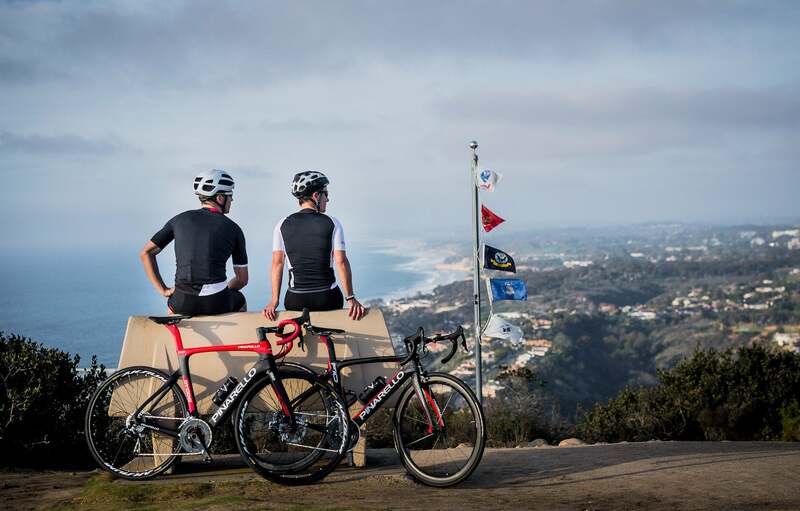 After attacking the spectacular Torrey Pines climb on the Southern California coast in the morning, we’re only too happy to go out in search of another local climbing destination. First though we can’t get enough of the stunning views of the coastline on this early winter’s day, as the Pacific Ocean is producing classic swells under a blue December sky. 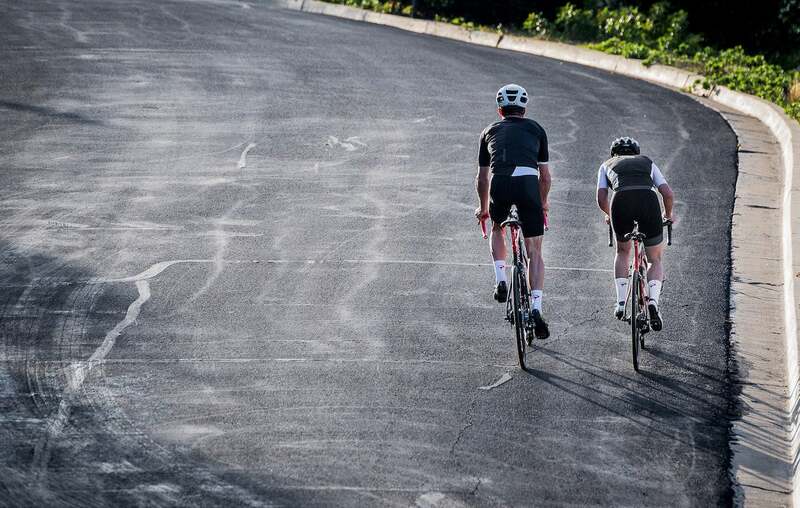 And then, of course, Torrey Pines has given our climbing legs a perfect warm-up. Mount Soledad towers above La Jolla, just north of San Diego. 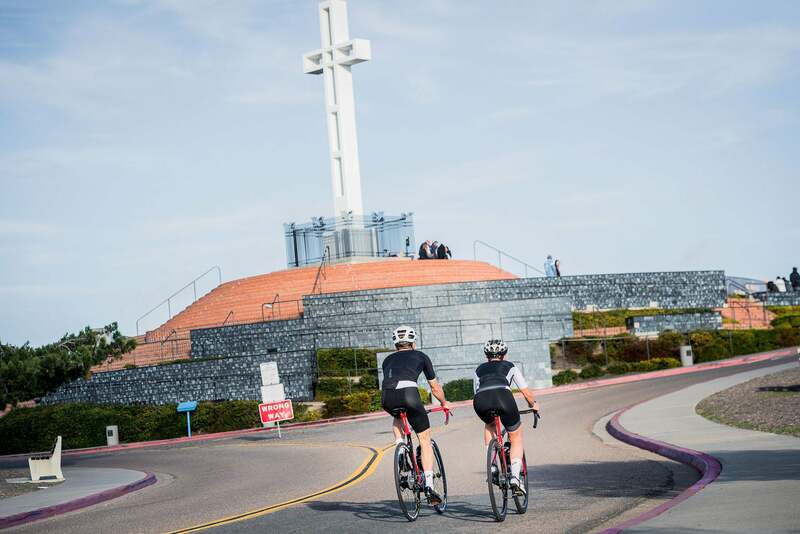 Capped off by a distinctive white cross that houses a war memorial, with plaques honoring more than 3,000 U.S. veterans, it can be seen for miles around. And the inverse is also true, for anyone that ventures up these steep slopes is treated to views up and down the Southern California coast. 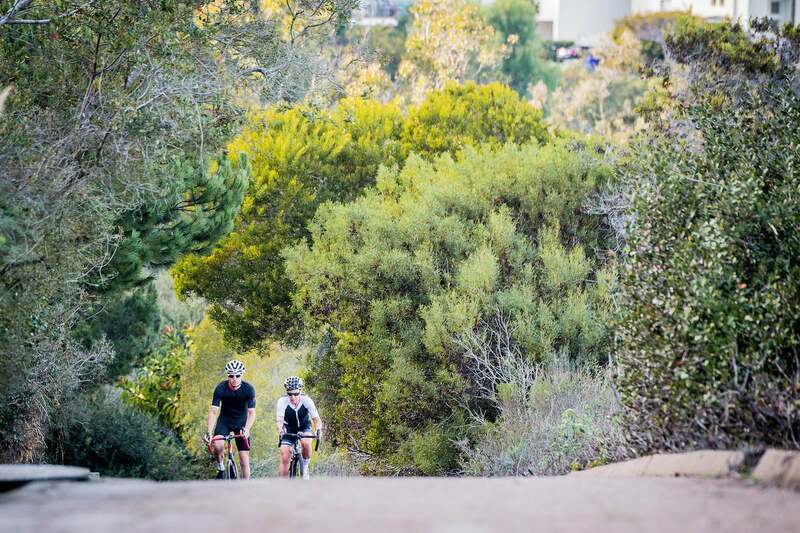 On paper, the Mount Soledad climb may not be that intimidating. After all, it’s not even 1,000 feet about sea level. 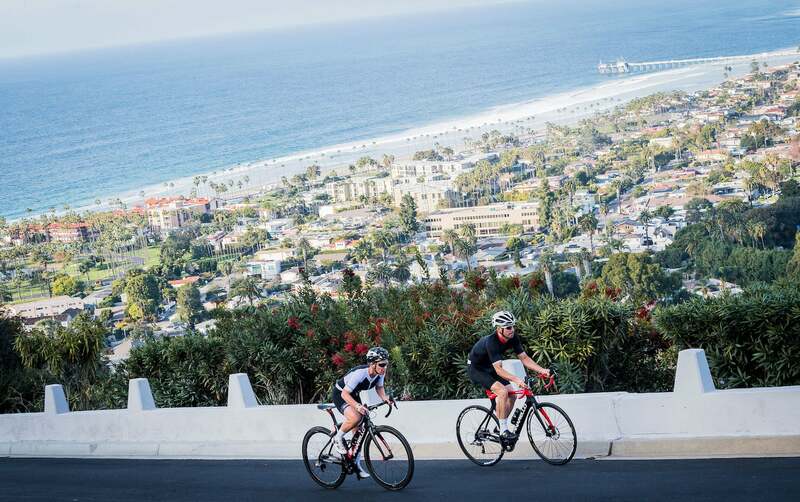 But starting at the ocean, with a total distance of less than 2 miles, it gets real steep, real fast, with pitches up to 19 percent. Rolling first up Hidden Valley Road, we quickly come to Via Capri where our two riders turn right as they wrap around the lower portions of the climb. 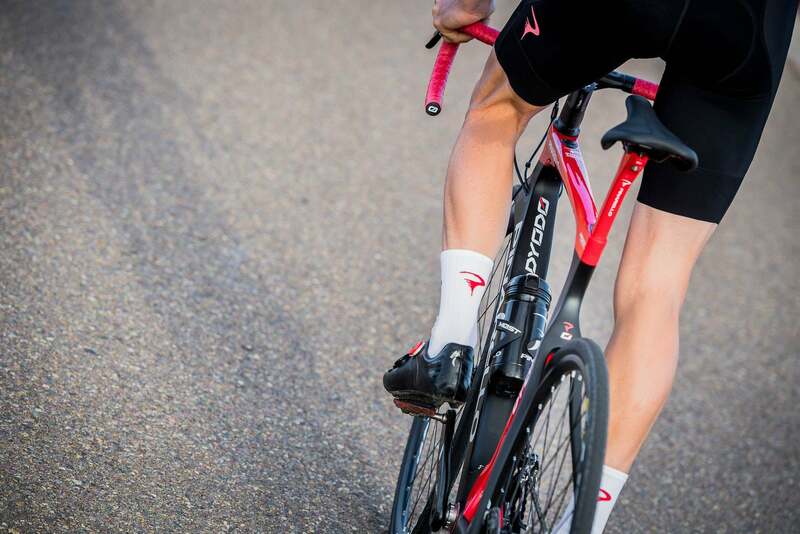 And while Sonja is again riding her trusty Dogma F10, Blaize is excited to test the true potential of Pinarello’s new Dyodo e-bike on such a steep and grueling climb. 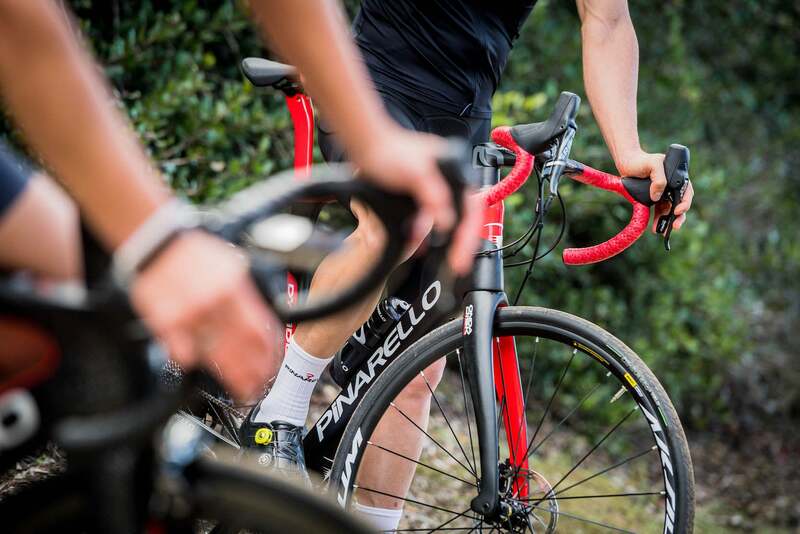 While Sonja negotiates the climb like a classics rider on a Belgian muur, Blaize appears relaxed in comparison as he shifts between the Dyodo’s three electric-assist modes. Clearly, he’s experiencing the climb in a different manner and he soon finds that the lower settings provide the perfect assistance over the challenging surfaces offered by Hillside Road. Little matter that the road continues to narrow as it’s reclaimed by Mother Nature, or that the pitch remains persistently steep. Blaize rides easily. Finally exiting Hillside Drive, the two turn right again on Via Capri as they make their final ascent toward Mount Soledad. Sonja knows her gearing well and rides with economy. Blaize, however, can wait no longer. Hitting the full-assist mode, he explodes up the final pitches and is quickly out of sight.